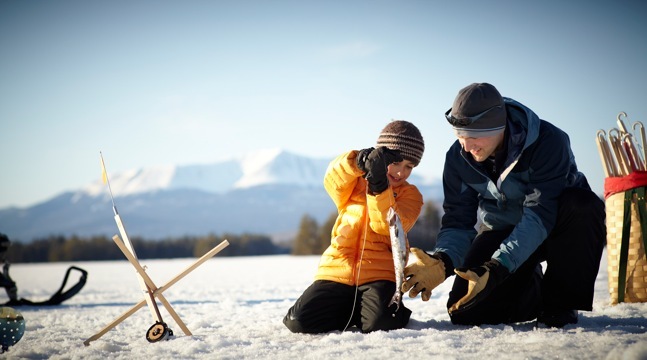 Ice fishing is very popular in Maine and we’re proud to offer our guests the opportunity to fish on the variety of local ponds and lakes in the Katahdin region. Opening day for ice fishing is January 1st. Join us on a guided ice fishing excursion and all equipment (augers, ice traps, bait, etc.) is provided. Or bring your personal supplies and tools and enjoy the winter bounty of our lakes and ponds on your own. Trips include Registered Maine Guide, equipment, snow suits, boots, and a hearty lunch.